Creating mind maps with Mind42 has its advantages. But as with every cloud service the question about data availability arises. With Mind42 your data isn't trapped in our database. We offer exports in various formats, so that you can simply download a backup copy, or export an image of the mind map to put it into a Word a document. Currently we offer seven different formats so that all use cases are covered. Below we'll explain all the different formats and for what they can be used. One word of advice though: when converting a mind map from one format into another (in this case, from the Mind42 format into any other format), there is always some information loss. Mind42 has features that other applications don't have, or implemented differently. We try to include every icon, link, note and so on in the exported format (where applicable), but apps like Freemind simply support different icons and features then we do, so, for example, some icons won't show up in the export. Mind42: The Mind42 format is our "native" data format. This data format can be imported and exported without any data loss. Like this it's suited best to download backup copies, or to be sent to others via email, so that they can be imported into their accounts. Freemind: Freemind is an open source desktop mind mapping application for Windows, Mac and Linux. If you want to use a real desktop app for mind mapping which is free, this is your best choice. MindManager: Mindjet MindManager is probably the most used desktop mind mapping application for professionals and businesses. Unlike Freemind it's not free, but offers a lot more complex features. RTF: RTF, short for Rich Text Format, is the small brother of Microsoft Word documents. It allows basic text formatting and can be imported into any word processor. This export format only includes the text of your nodes in a hierachical structure. This means that every node is represented by a heading, its children by sub-headings and so on. This is a great starting point to convert your mind map into an outline for any text document. JPEG: A very well known picture format. Usually it's better suited for photographs than plain diagrams (like mind maps), but since probably everbody knows it we included it in the list. 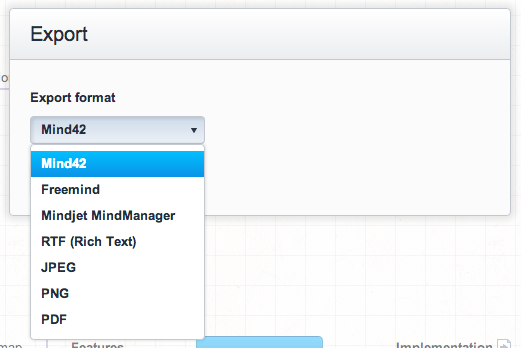 Your mind map will be exported as an image, so everything you see in the editor will be part of the image. But this also means that every non-visible attribute (like links, notes, ...) will not be part of the image. PNG: An image format which is less known, but better suited for mind maps than JPEG. We would recommend that you use this format if you want your mind map as an image. The same limitations described for JPEG apply. PDF: PDF, short for Portable Document Format, is a very well known file format for any kind of document. Like this it's suited very well for mind maps. The same limitations described in the JPEG format apply (only visible data is exported), but on the other hand it offers some unique functionality. Continue reading to learn how to print mind maps using the PDF format. The official way to print mind maps in Mind42 is to export it in the PDF format. When choosing the PDF format you'll see a second dropdown box appear where you can choose a paper format. The default option is to export a single page PDF. This means that the mind map is not limited by any real world paper sheets, but the PDF will simply be as large as it needs to be to fit the whole mind map. When printing this, it will simply scale down the map to fit on one page (which usually is very small). Therefore we offer paper formats like A4 and Letter. When choosing one of these, the map will be split onto multiple pages (at a reasonable size) so that it could be printed and sticked together to get one big mind map.